Please vote for "F" & "T".. Thank you! Thanx!!! 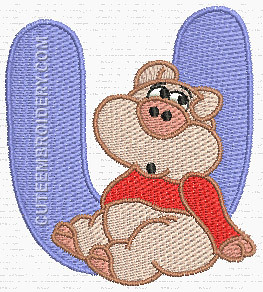 This Piggy is UUUterly astonished, that we are getting close to the end of the alphabet!!! As wonderful as always! Thank you! Many thanks for another lovely piggy. Gracias, con esta letra voy a bordar la bolsita del desayuno para mi hijo. files updated. appreciate your help. thank you. Love the Pigs and there is a problem with the first six formats; they are "T" but not the last five; they are "U"
I'm not thinking good today. This design comes up T on the hus download page. Donna from Okla. This comes up T when I try to download it.